British Eleanor Pinfield heads up the Art on the Underground team at Transport for London, leading Art on the Underground’s ambitious series of projects bringing art to millions of people every day. Since 2014, Eleanor has commissioned work from a wide range of leading international artists including Heather Phillipson, Njideka Akunyili Crosby, Assemble, Laure Prouvost and Linder. In 2017, Eleanor oversaw the completion of "Diamonds and Circles", works "in situ" by internationally renowned artist Daniel Buren, a permanent artwork at Tottenham Court Road station. 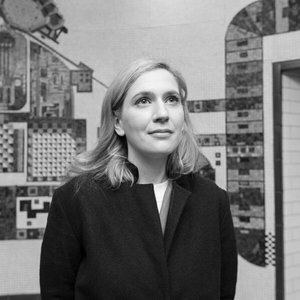 Eleanor joined Art on the Underground in 2014 from Tate Modern, where she led the curatorial management of The Tanks "Art in Action" programme, delivering a changing live programme of commissions from acclaimed artists including Anne Teresa de Keersmaeker, Tania Bruguera and Boris Charmatz. Eleanor is a member of the Fourth Plinth Commissioning Group and sits on the Crossrail Art Programme Advisory Group.